John McCormack had the most liked content! My short door TR2 daily driver owned since 1976, TR6 daily driver owned since 2016 and long door TR2 owned since Jan 2017 undergoing restoration. Sailing my S&S34. It is a good garage. I can fit another TR type car in there. Just saying .... We went from a 5 bedroom house with a single carport to a small 3 bedroom house with an 8 metre by 7.5 metre garage. I'm happy and we are closer to the grand kids so mum is also happy. Loosening the stanchion screws worked. The car reached a milestone today with the addition of the windscreen and yet again the assistance of members here has been invaluable. Mount the other front overrider, windscreen wipers and fit the Commission plate (TS3732O) and she can get registered (MOT'd) on Historic plates. It has been 2 years 3 months since I bought her in pieces. Once that is done the upholstery can go in to make her usable. Finishing touches will take a quite bit longer. Good advice. I'll try it. Thanks Stuart. A local owner suggested the same. My problem with doing that right now is that I am a bit concerned the new paint job on the car may also be contributing to my problem, too much paint may resulted in the brackets being too far apart. Grinding the stanchions may add to my problems if that is the case. I had my windscreen side brackets, the bits the windscreen attaches to the body with, chromed. Unfortunately it appears the chrome is so thick the screen won't slide home into position. Does anybody have a pair of old ones I could buy? The repair completed today. There doesn't appear to any particular reason for the cracking to occur. The shocks are fine, everything appears normal. Old age maybe. 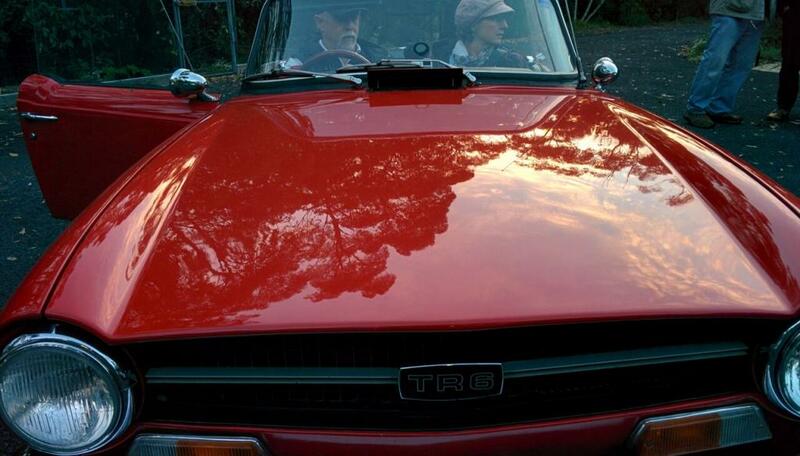 The TR6 is driving superbly, it is a class act that would have been magic in 1970. They were too expensive for me back then. I run wide belts but the narrow one is far more convenient. With about 60kgs standing behind the seats I can jack the axle up about 1". So there is movement. I didn't remove the shocks in this test. They are a pain to get out because the lower link attachment is too close to the spring and getting it out requires the ubolts to be loosened to lower the pad. I had removed one already and it moved reasonably well through its range. The springs do seem to be pretty stiff, once the 1"was achieved they weren't compressing anymore. I will drive it to get a wheel alignment, a couple of kms, which should be far enough loosen it up if it is going too. Sounds like the solenoid isn't earthed properly. Mine did this, the earth lead was loose then came off. I have also had the solenoid fail when hot. The solenoid operated electrically but the seals go hard over time and won't hold oil pressure when the oil thins out. Check the earth, then try a new solenoid. Thanks Graham. The gauge appears well earthed via the mounting bracket. I find a poor instrument earth is revealed by tapping the gauge. Thanks Bob. I'll bend the shaft tomorrow. The tabs look to be right but if I can move the lower one a bit I will. I am hogging this forum but here is another issue I need help on. The previous owner bought this TR2 in 1966. When he started the restoration about 10 years ago he dismantled, cleaned and reassembled the rear springs with good lubricant between the leaves. They have the same number of leaves as the standard ones on my other TR2, 6 I recall. I installed them with new bushes. He had the rear shocks rebuilt professionally and they move quite normally. A bit stiff but nothing out of the ordinary. Now I am driving the car the rear suspension is very stiff on both sides. It is very bouncy on the bumps down my rear lane. I removed a shock to check it wasn't too stiff. It moves through full throw with only moderate pressure. I also backed off the rear hanger bushes as I had clamped them up tight. The car is still pretty light, no upholstery except the drivers seat, no weather gear, windscreen, spare wheel etc. The car was used primarily as a race car before the previous owner got it. Would it be possible the springs are set hard for racing? I would have thought that would be achieved with an extra leaf which it doesn't have. Is there a simple test I could do to assess this without removing them.